New Zealander Paul Coll faces James Willstrop in the first round of the Canary Wharf Classicd after a withdrawal by Nasir Iqbal allowed him to bypass the qualifying competition at Wimbledon. 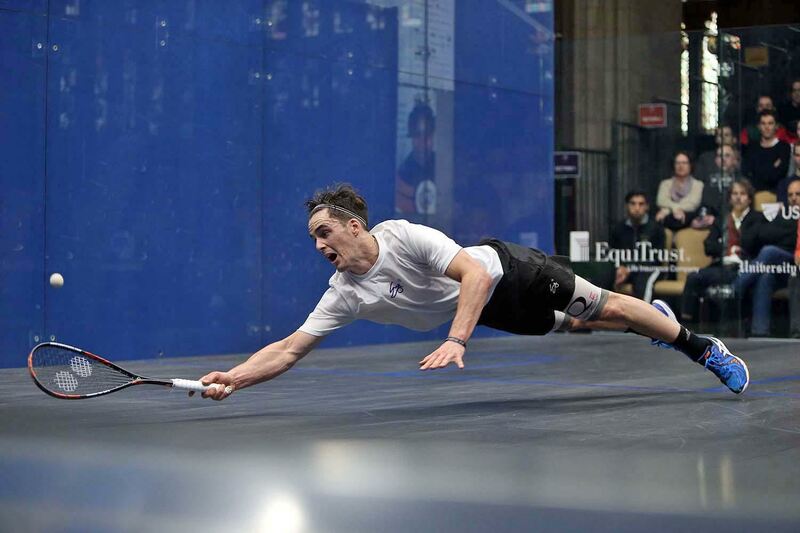 Here he tells Alan Thatcher about life on and off the squash court, his addiction to gym work, and his propensity for some spectacular dives across the court. 1: Paul, congratulations on receiving an upgrade ahead of the qualifying competition and a place straight into the Canary Wharf Squash Classic main draw. How do you feel about playing James Willstrop in the first round before a full house at the East Wintergarden on Tuesday night? 2: You have already won one tournament in London so far, triumphing in the London Open back in November. You had a 74-minute battle with Ben Coleman in the final. That must have been some match. A: Yes, that was a tough match. There were a lot of decisions in that match, which always take up a bit of time. But Ben is a good player so I was happy to come away with the win. 3: You also won the Australian Open – always a great thing for a Kiwi to do. Beating Australian number one Cameron Pilley in the final must have made it taste even sweeter. What did you take from that win? A: Winning the Australian Open was a huge confidence boost for me. Knowing I can compete with a very solid top 20 player like Cameron Pilley. And yes, winning on Australian soil is a very nice feeling, Haha. 4: You have a reputation for being one of the best divers on the PSA Tour. What was your favourite dive, and can we see it on YouTube? A: Ha-ha, I’m not sure of my best dive. I don’t like them, because they hurt! I haven’t had a lot of TV time but maybe at the Commonwealth Games the doubles match against England there was a fair bit of time with me on the ground! 5: What did you think of Mathieu Castagnet’s dive and chase against Daryl Selby in Chicago last week? A: Hilarious. I just watched Daryl Selby the whole time. His reaction is priceless! But Castagnet’s dive and get has to be the best of all time. 6: Let’s delve into some personal territory. How often do you and your girlfriend Nele Gils train together? 7: And do you have a laundry rota for all the squash gear? A: Ha-ha! We share the laundry load. Whoever is least tired from training usually does the heavy lifting. 8: I’ve seen some video clips on Facebook of you lifting some impressive weights. How much time do you spend in the gym? 9: Who are your main sponsors? Feel free to give them all a nice mention. A: Have just recently signed with Eye Rackets. Loving the gear and rackets. It’s a top quality squash brand that I highly recommend to any level squash player! Also Compressport Australia for my compression gear. Top-of-the-line stuff! 10: How is squash performing back home in New Zealand? Do you feel the sport is growing? A: Squash is going okay back home. There’s a lot of enthusiasm in clubs and now we are seeing more and more PSA tournaments back home, which is awesome to see! 11: How do you split your time between NZ and Europe? A: This year most of my time is spent in Holland with my girlfriend, but we are planning a trip back to NZ for the PSAs and my Nationals. Thanks Paul. 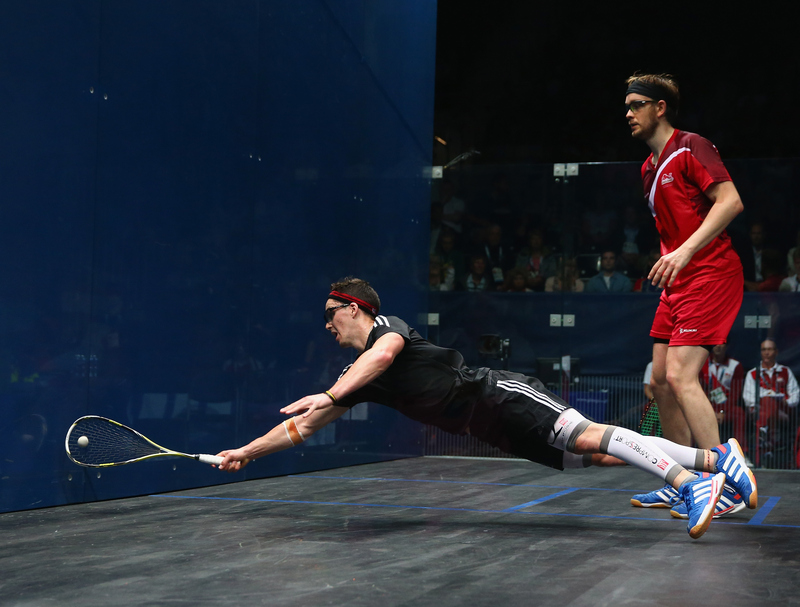 Looking forward to seeing some great squash, and maybe the odd dive, at the East Wintergarden on Tuesday!